If you’re looking for a smart doorbell, your search may have brought you to a comparison of Zmodo vs Ring. 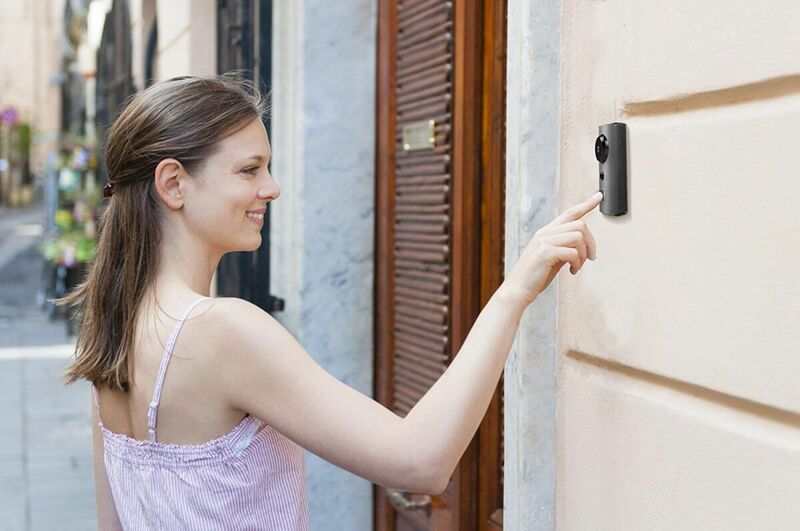 Both of these video-capable doorbells allow you to see and speak to individuals on your porch, giving you a live feed of what is happening outside your door day or night. But for all the similarities between the Zmodo Greet and the Ring Pro, there are a few distinct differences that may influence your buying decision between Zmodo vs Ring. 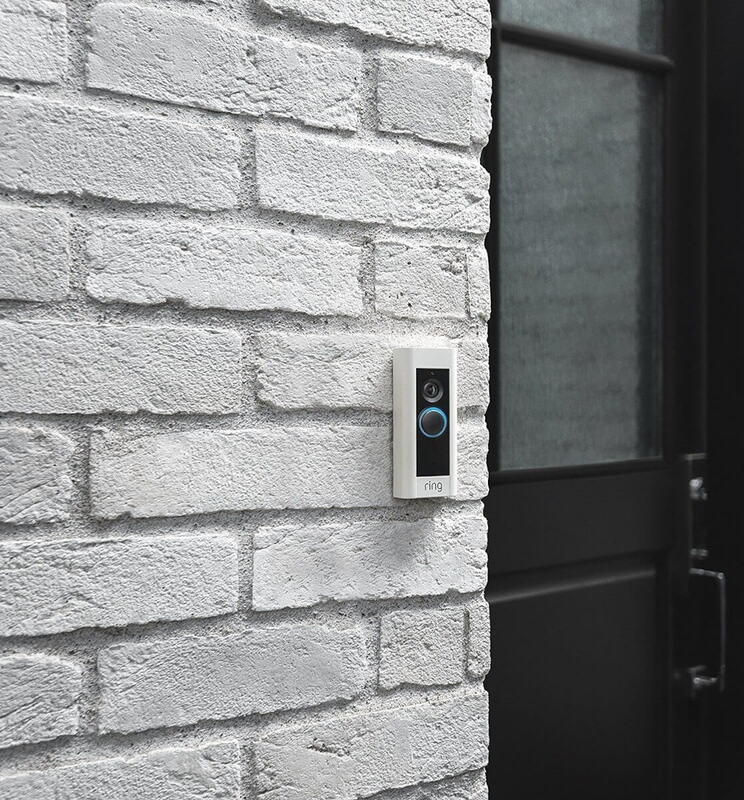 We’re big fans of taking smart home technology outside the home with high-tech doorbells, as we’ve previously shared with you our in-depth comparison of the Ring, August, and Skybell smart doorbells. 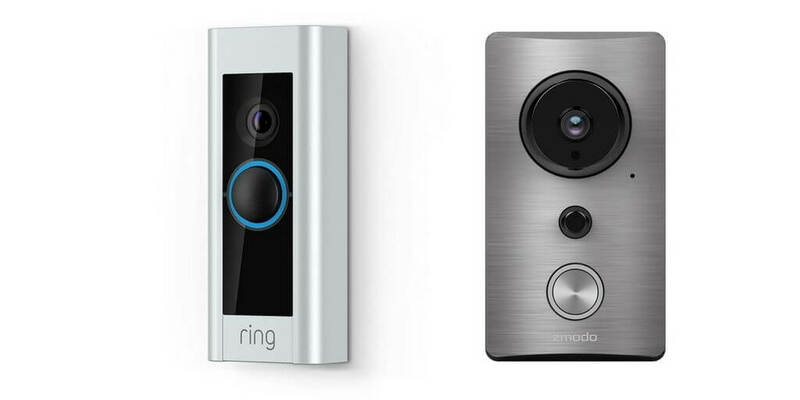 In this comparison of Zmodo vs Ring, we’ll highlight the most important considerations when choosing a doorbell for your smart home. Quick note: If you’re still stuck debating between the Ring and Ring Pro, then take a look at our comparison of the two models. 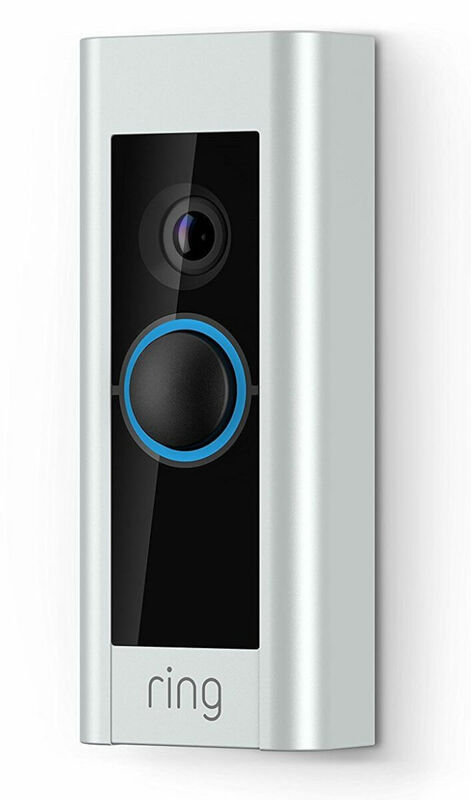 A smart doorbell is only as good as the video feed it supplies. Factors to consider include resolution, night vision capability, field of view, and the ability to get a live glimpse of what is happening outside. Ring Pro wins this one with superior resolution and a wider field of view. Both units offer night vision (though only the Zmodo Greet is adjustable) and video feed accessible via an app. Currently no cloud storage available, but the unit features 8gb of in-unit storage. Since footage is stored locally, no monthly fees are incurred to store video. The downside is that if the unit is stolen or damaged, the video history will be lost. Cloud storage costs $3 a month, and gives you access to 6 months of video footage. No in-unit storage, so if you want to keep a history of what the unit has recorded, your only choice is the monthly subscription. Its on-board storage is a nice feature, and edges out the Ring Pro since it doesn’t lure you into an added monthly fee for cloud storage. Rumor has it that optional cloud storage may be available for the Zmodo Greet in the future – so if this is important to you, then stay tuned. Both the Zmodo Greet and Ring Pro offer live motion alerts – a handy feature, since you won’t be watching your video feed 24/7. Sends a 30 second clip to your device whenever motion is captured within field of view. No custom motion detection zones. Receive alerts to your device whenever motion is captured within pre-set activity zones. Customizable motion zones to eliminate false alarms from routine activity. If you’re concerned about being bombarded with false alarms, then choose the Ring Pro for its advanced motion zones. You can rule out areas with routine traffic, while focusing on more important areas (such as the walkway leading to the front door). While Zmodo isn’t as specific on temperature range, the unit is ‘certified for outdoor use’ according to the manufacturer’s website and claims to be immune to the effects of heat, humidity, snow, sleet, or rain. Rated for temperatures from -5 degrees to 120 degrees Fahrenheit (-20 to 49 degrees Celsius). It’s hard to say which unit is the more weather-robust smart doorbell, since Zmodo Greet’s weather claims are a bit vague, and Ring Pro isn’t rated for temperatures below -5 degrees Fahrenheit. If you live in a pleasant climate year round and don’t have to worry about extreme cold or heat, then congratulations! Either unit should hold up well. If you live somewhere it is colder than -5 degrees, then we probably wouldn’t subject the Ring Pro to such harsh conditions and would put the Zmodo Greet to the test. One option is to purchase the unit with Beam, which serves as a hub for all Zmodo smart home products and a WiFi extender (increases WiFi signal up to 656’). Other Beam integrations include window and door sensors, making it a largely security-focused smart home system. When it comes to smart home integrations for Zmodo vs Ring, we have to give the nod to the Ring Pro. The creators of Ring have integrated the unit to work with many different platforms in smart home technology, with a focus on locks that enable you to open the door to whomever you wish. Zmodo’s Beam hub is much less recognized and will limit which smart home gadgets integrate with your doorbell. Not everything fits into the most common criteria for smart doorbells listed above. Some units possess some pretty neat features or finishes that we just have to mention. Ability to pre-record a message that can be played when you’re unable to answer someone at the door. Slim design that looks more like a traditional doorbell. Availability of attachments to modify the way that Ring Pro is installed and enhance functionality. For instance, an angled mounting bracket can adjust the unit to better capture the view of unique entryways, or you can purchase an indoor chime that doubles as a WiFi range extender. The special features of Zmodo vs Ring Pro appeal to different needs. However, we like the idea of pre-recording a message for those days when you’re too busy at the office to answer the door or on a family vacation (not that we suggest including that detail in your message! ), so we’d give this category to Zmodo Greet. If you’re looking for a unit with all the bells and whistles, then look to the Ring Pro. While the Zmodo Greet has its unique features (like built-in video storage and a pre-recorded greeting), the enhanced technology of the Ring Pro puts it ahead. Custom motion zones and integration with other smart home systems give Ring Pro a more advanced range of capabilities. And since both units need to be hardwired into your home’s electrical system, you’re looking at similar installation processes. While Ring’s required cloud storage is an annoyance, it is actually quite affordable when it comes to monthly cloud storage plans. Share with us which feature of a smart home doorbell is more important to you: the ability to pre-record a message, or to store 6 months of video footage in the cloud? Since they’re so big on smart device integration, I want them to let users use their cloud service of choice so they aren’t subject to paying a fee to utilize this feature. As for the Greet, I want a doorbell with a bronze finish to match doorhandles and the porch light. Instalization? The Zmodo has to be used with your hardwired system. What about the Ring? ring has it’s own power so doesn’t require your current hardwired system but you’ll have to by a chime if you want to hear it inside. The Ring Pro requires quite extensive installation and must be hard wired. The transformer for the doorbell might also need to be upgraded. I am an electrician by the way. It also has a non-serviceable battery in it that fails commonly after about a year and a half. 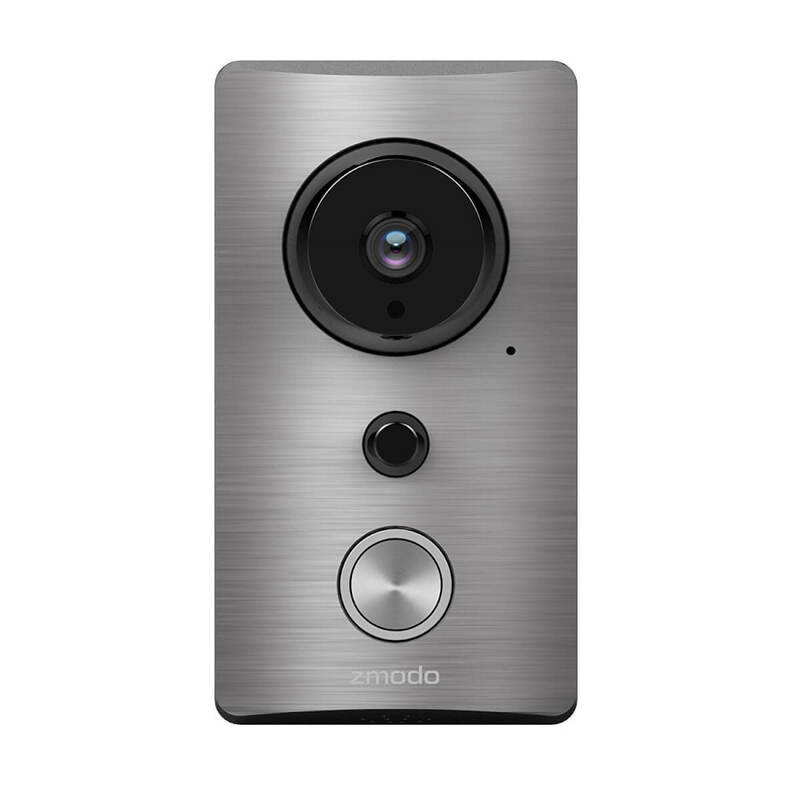 I just replaced my battery to get it working again but I am looking for a better video bell and the Zmodo Greet Pro Doorbell looks like a winner to me and I will be switching. I already have a Zmodo 1080P POE security system so it will be nice to have all the cameras in one spot.